On the upside, everything I did make from The Book was a total culinary win. So, let’s get on to the recipes! This recipe is under appetizers but I halved the given recipe down and it made a great light lunch for my mom, grandma, and myself. We kept it simple and served with some toast points for catching the bits that remained after we cut the tomatoes apart. Really simple tuna salad (tuna, mayo, mustard, caper) but incredibly tasty! Loving the capers. They added a bright, tart flavor with enough saltiness that I didn’t add any additional salt. This was a flavor revelation in our household; both my mother and I have been putting capers in all our tuna salads from that point out! So tasty. Does anyone out there have a clue where I can find Amarone wine? Because I have yet to see it in any of my local liquor stores (some of which are very extensive). 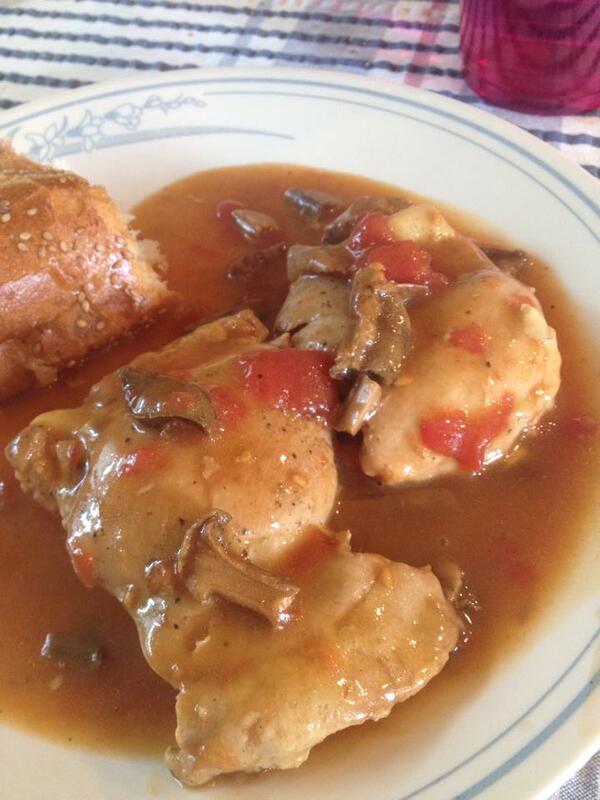 Instead, I just did this with a Merlot because… Well, we always seem to have a bottle of Merlot hiding in the pantry. I think they breed down there, in the dark. I’m glad I forged ahead and tried this recipe anyhow. It was worth every minute of the long cook time. At the end, we were greeted by fall apart tender meat and the gravy this creates is absolutely delicious (both over the meat itself and over the Parmesan mashed potatoes I served it with). 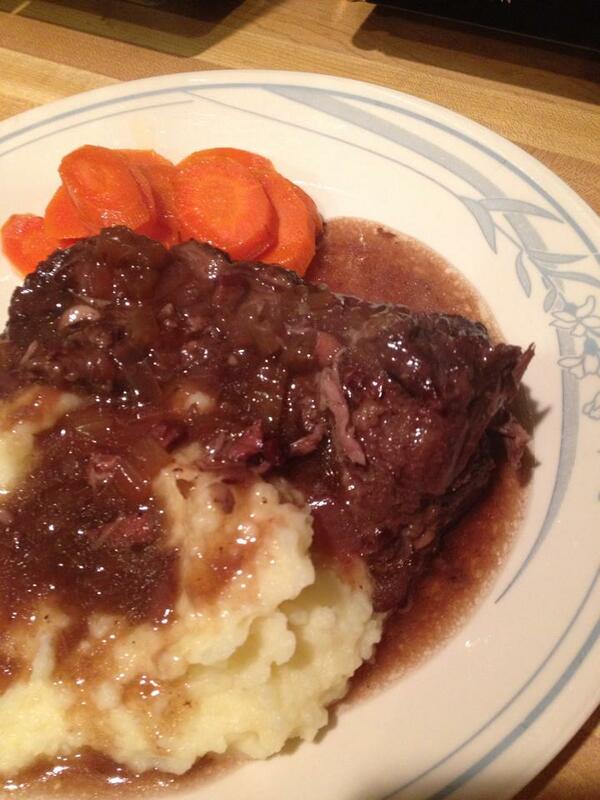 My husband, who is the resident pot roast maker, was floored by how delicious it was. My husband is a meat lover through and through. 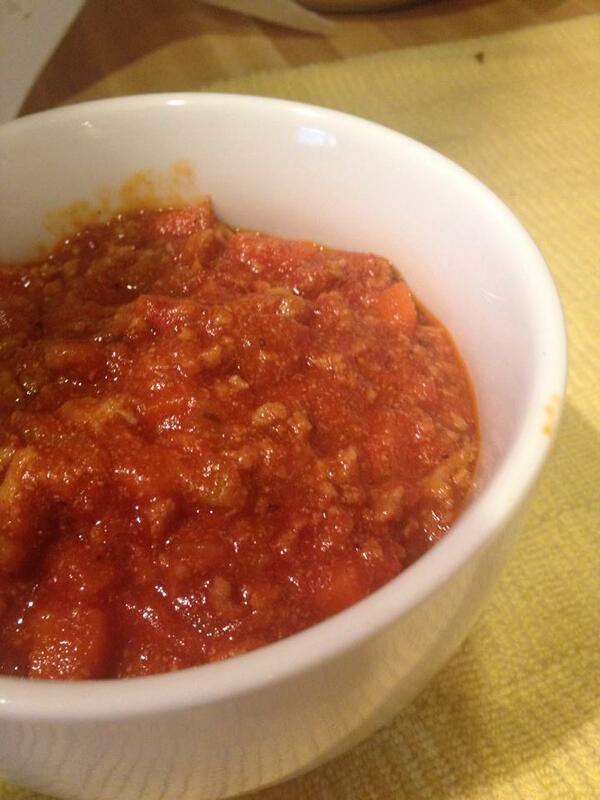 So, if I say casually that there is another variation on Marcella’s beloved Bolognese, it should be no surprise to me that it is requested for dinner that very night. This is another low n’ slow labor of love; perfect for a Sunday gravy. It was well worth the six hours on the stove. (Granted most of that is hands off simmering time, so it’s not exactly labor intensive. But smelling it cooking all day is kind of torturous…) This version tastes a little lighter and sweeter than the all beef version. While we love the all beef, I thiiiiiink we like this version just a bit more. I’ll probably do the 2:1 beef-pork mix from now on! 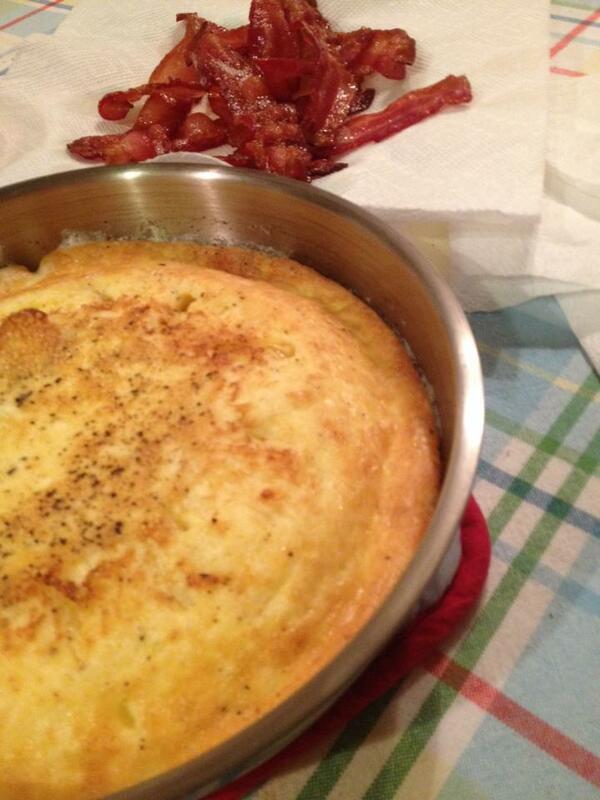 I also made a double batch of it that day because…why not? It fed the whole household that night over rigatoni, and there was enough to be baked with cheese ravioli and some mozzarella to make a lazy lasagna during the week. Win. Hold the presses here, people. I GOT MY HUSBAND TO EAT CAULIFLOWER!!! As you can probably guess, my husband is not a fan of cauliflower. However–I love it. And in this dish? I could have ate the entire bowl myself, as a meal. 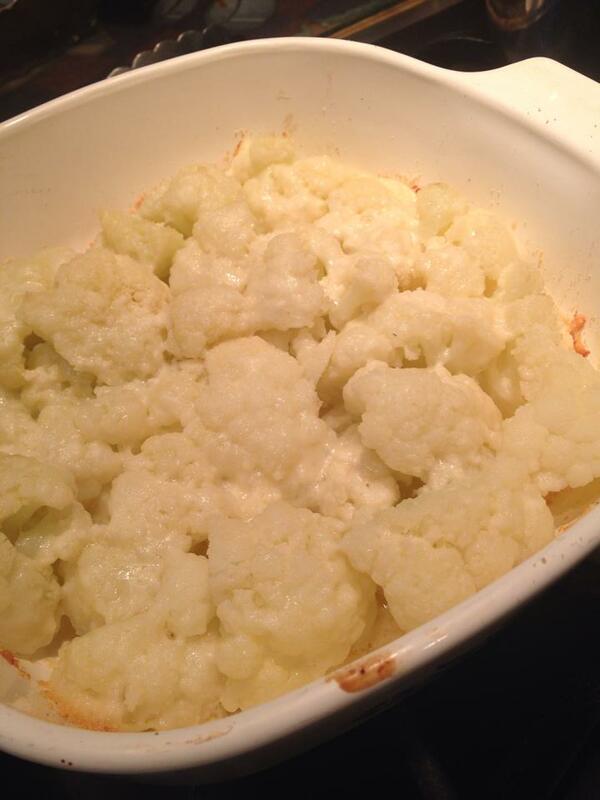 It was a really yummy way to make cauliflower and I will certainly make it again. Her boil/bake method made this sweet, tender, and buttery delicious. I ate a shameful amount and my husband ate slightly more than a courtesy portion, so I consider this one a win. I was having a rough weekend (I think I was getting over a cold or something) and really just wanted something I could toss on the stove to do its thang while I did other things. This fit the bill. 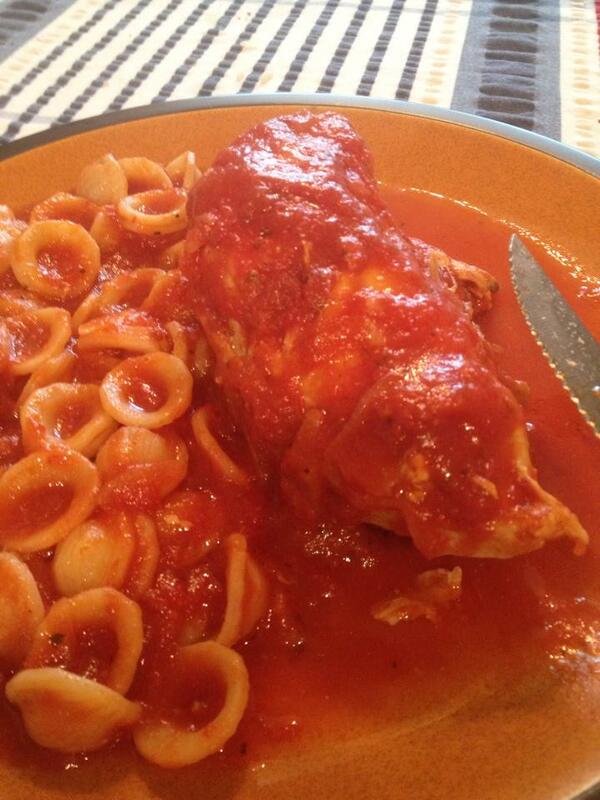 My husband, however, is a fan of the chicken/red sauce combo, so he was quite happy with it. Good enough for me! I made this with boneless, skinless thighs (because it is what was readily available in my freezer) and, honestly, we didn’t miss the skin one bit (which usually gets too soft during braising for my taste anyway). I think the sauce this makes would be equally good over pork. Or beef. Or a tire. 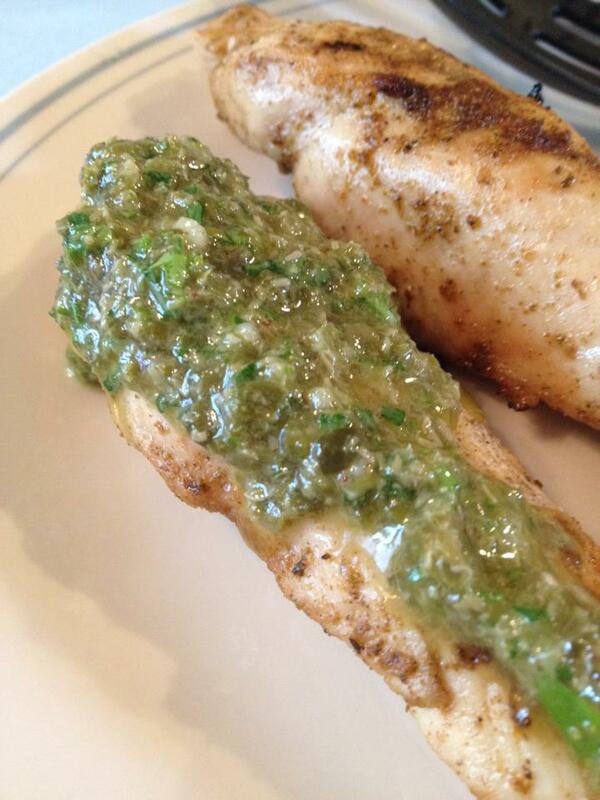 I served this with mozzarella-garlic bread and we sopped up every bit of that amazing sauce. This was pretty quick and easy. I loved the sauce but my husband didn’t. Granted, I knew he didn’t like olives before making this one–but he keeps swearing he wants to try to get out of his comfort zone and try new things. I figured he could just pick them out if they bothered him… but even after picking them out wasn’t enough; he pushed the sauce off the meat entirely. Apparently their flavor contaminated the rest of the sauce for him. ::sigh:: Oh well–can’t please everybody. 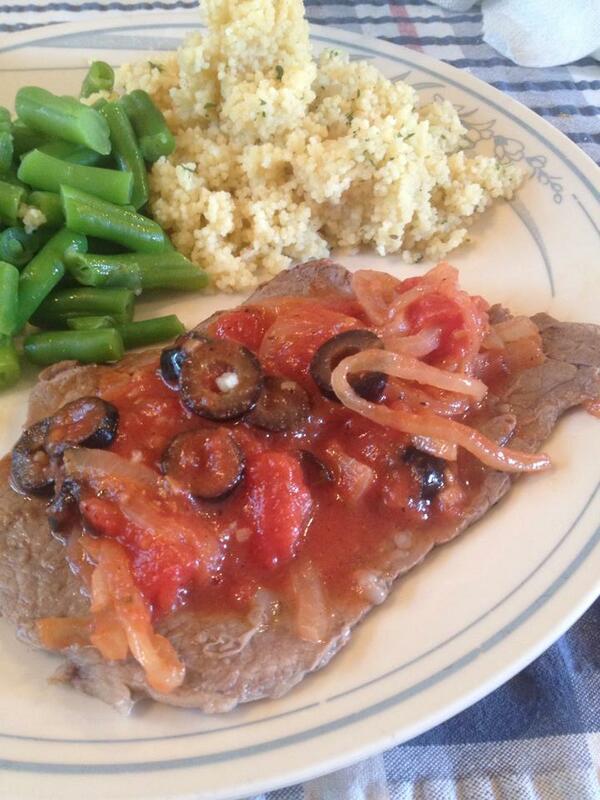 I, on the other hand, love olives, onions, and tomato so the combo was a win for me. I even mixed the extra sauce (since I only made two steaks but all the sauce) onto my Parmesan couscous and ate that too. Delicious. 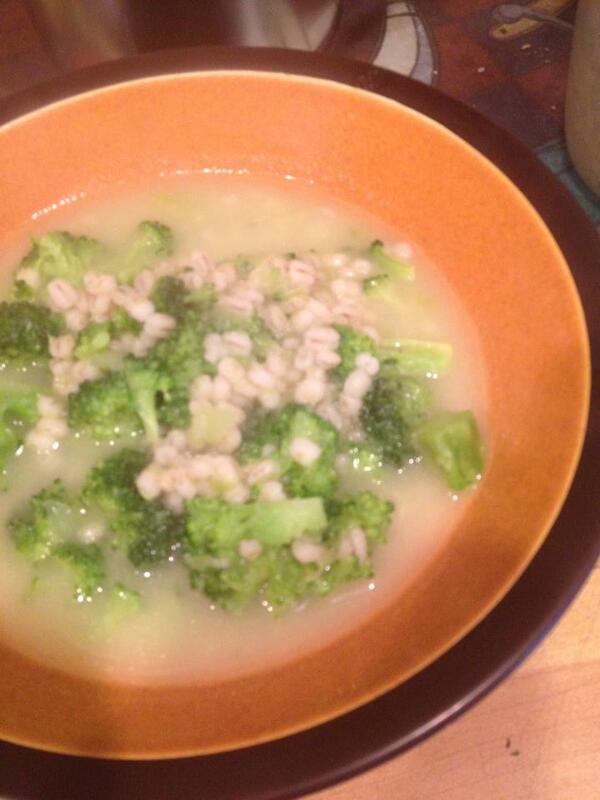 I used regular barley (go Goya!) since I didn’t have (and couldn’t make) egg barely. I wished I had made a double batch; it was very tasty. 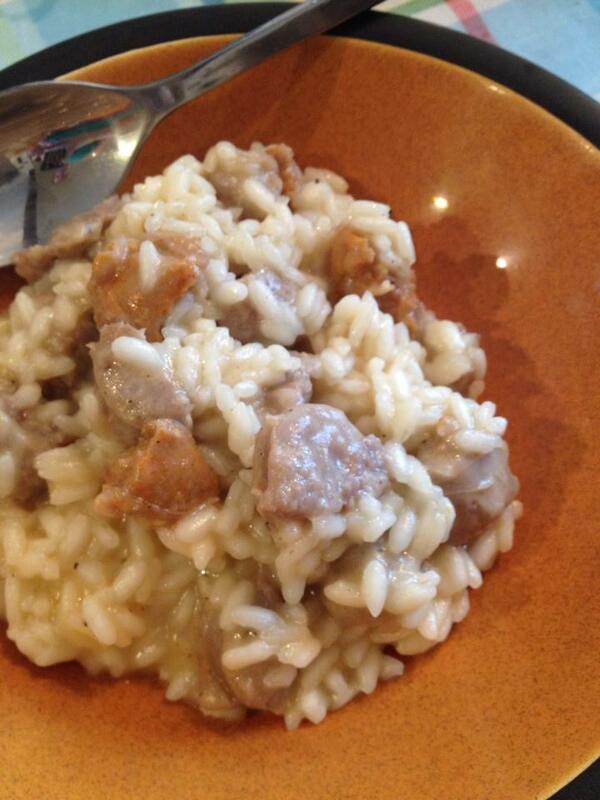 Once upon a time, I was scared to make risotto. I am so infinitely grateful that a dear friend broke me of that fear. I love risotto and I love being able to whip some up any time I want. And, honestly? I haven’t had a bad Marcella risotto yet! Although I hated myself 10 minutes in, in the 85-degree kitchen with two burners going and a pot to keep stirring, it was well worth the effort. This was super tasty–rich and creamy, but not exactly heavy. A great stand-alone risotto that pretty much made itself a meal. All we needed to go with it was a salad. Although Marcella recommends a mild sausage only, we were out of our favorite Whole Foods mild Italian sausage and I had to make due with the local Stop n’ Shop’s selection. We’re not fennel seed fans and most of the mild sausage selection had lots of fennel in them, soooooo I made the executive decision to do a blend of hot and mild sausage instead. It was a winning decision, if I don’t say so myself. Again, this is in the appetizer section but we ate these as an entree–and I am very glad we did. 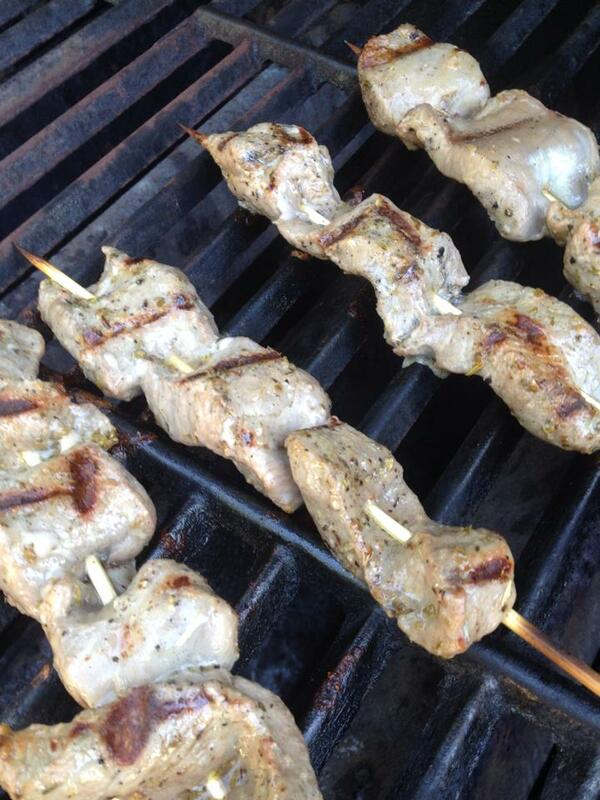 Two skewers each made a perfect protein portion and… Wow. They were total and complete nom! …and I think anything with “tidbits” in the title is a win by me. It just sounds fun! If you like lamb, definitely make this one. How did this escape my notice for so long?! 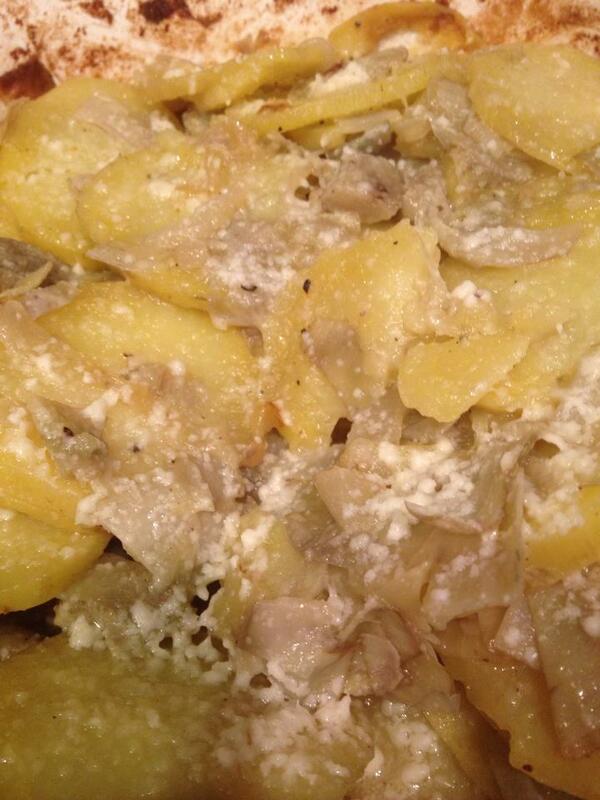 This is another side dish I could totally eat alone, as an entree. Its not much to look at (sorry!) but I promise you, this stuff was incredibly tasty. Buttery soft potatoes, nutty Parmesan cheese, mild yet earthy artichoke flavor, and a sweet note from the semi-caramelized onions? Culinary win right there. 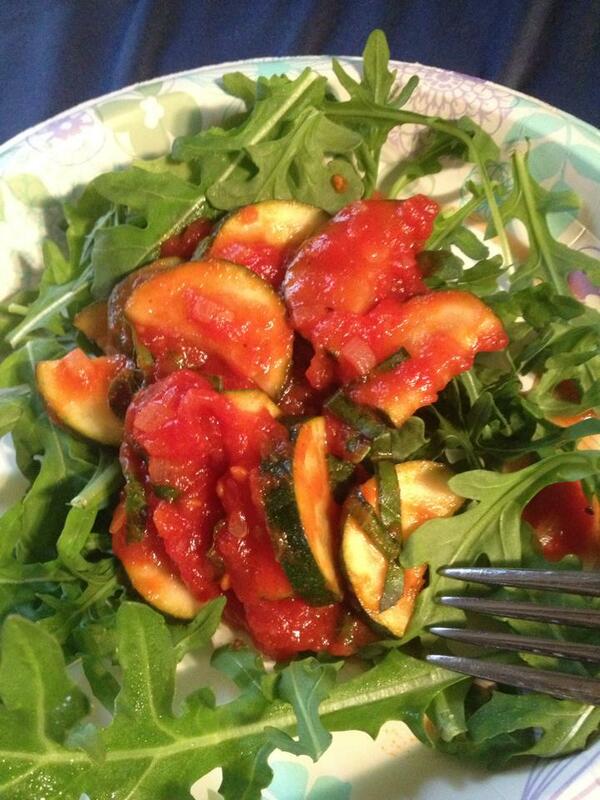 This mix was delicious over roasted spaghetti squash, or a over bed of baby arugula for a lighter meal. I forgot the parsley (doh!) and kind of, sort of made up for it by doubling up on the basil. Although, honestly, if I had had the parsley I probably still would have doubled up on the basil. Because I’m just a basil whore. 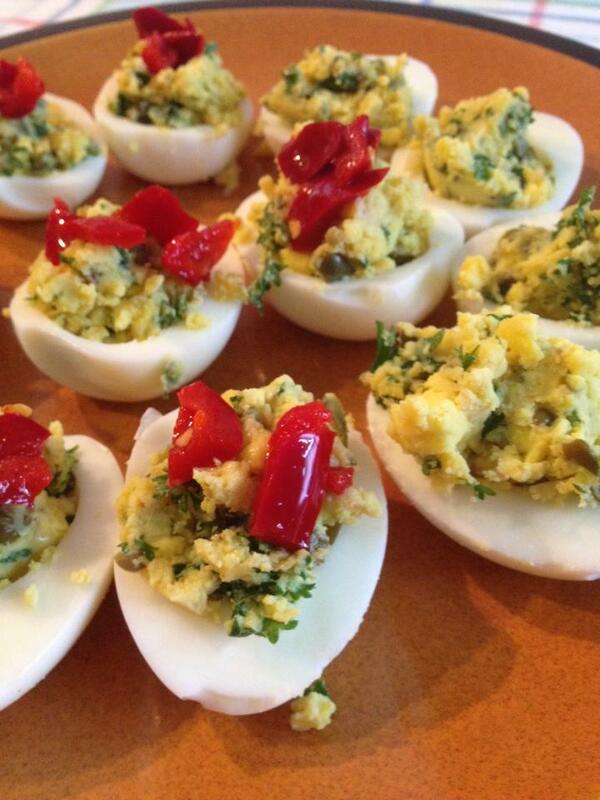 Essentially, these are Italian-style deviled eggs. I love deviled eggs. However, I don’t normally consider them lunch fodder with all that mayo and whatnot… These? Not a speck of mayo. Healthy deviled eggs are back on the menu, boys! So. 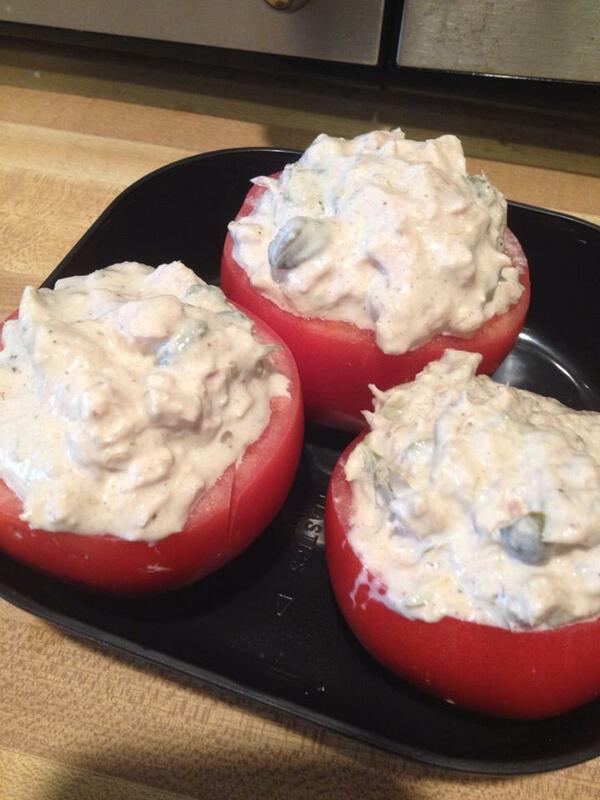 Capers in tuna salad was already a known win for us. Capers in egg? Also freakin’ delicious. I will be putting capers in my egg salad from now on too, thanks to Marcella. I strayed from the recipe just a tiny bit. She called for diced red bell pepper atop the eggs, but I had no fresh peppers. I did, however, have a jar of Trader Joes Hot & Sweet Cherry Peppers. They were a delicious substitution! Lots of garlic in this sauce (five cloves) but Marcella was right; since you do not cook it first, it poaches in the hot tomatoes and really adds a great mellow garlic flavor to the whole thing. That mellowness played very well with the heavy basil note. 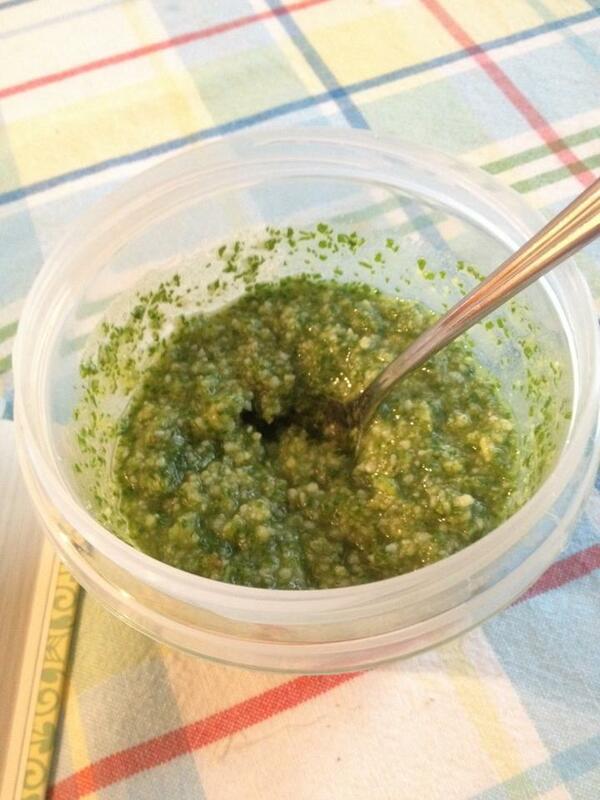 Remember: I’m a self professed basil whore. I may have gone a little overboard buuuuuuut more basil = more delicious to me. I loved it. My husband loved it. We both wiped up every bit of sauce with some crusty Italian bread. Not bad but not great. I’ll use it all up, but I wasn’t wowed by it. Honestly, I’ve had better bottled pesto and this first attempt at making homemade didn’t come anywhere close to being as yummy as the fresh tub I usually pick up from the our local farmer’s market. Not sure what went wrong. It just tasted… Off. And, while I only added a tiny pinch of salt, to the basil-oil-nut-garlic mix, as she says to it was also a touch too salty. Y’all know I’m a cheese lover too, but–in this instance–I felt the cheese flavor overpowered the basil. Aaaaand I really wanted more of a basil punch. Humph. Normally I’m not fond of “set” eggs. I prefer my yolks runny or my scrambled eggs loose. My husband is more of a well done scramble or omelette guy (though I recently introduced him to the deliciousness that is egg yolk + bacon). So, rarely do we agree upon eggs. This, however, was really tasty and we both liked it. I used Parmesan but cut it down to 1/2 cup rather than a full cup. It was perfectly cheesy to us and I don’t think it needed the other 1/2 cup. In hindsight, I should have cut my potatoes smaller. This dish took almost an hour for them to cook all the way through, which was a bummer, but–oh well. The tomatoes were mushy and sweet, the peppers were tender and… well, do I even need to sing the praises of roasted onions? In the end, everything was very tasty. Loved the roasted tomatoes and onions most of all, and the olive oil/juices left in the pan were delicious too. Oh man, where has this one been all year?! I’m not a huge fan of chicken, unless it’s breaded or in some sort of sauce. So, when I decided we were just doing a simple grilled chicken for dinner with the mixed veggies, I looked to see what sauces Marcella had for me to dip in. I had everything for this one in the pantry so it won by default. Very glad I tried it! It was lovely; herbal and tart–just my kind of flavor! 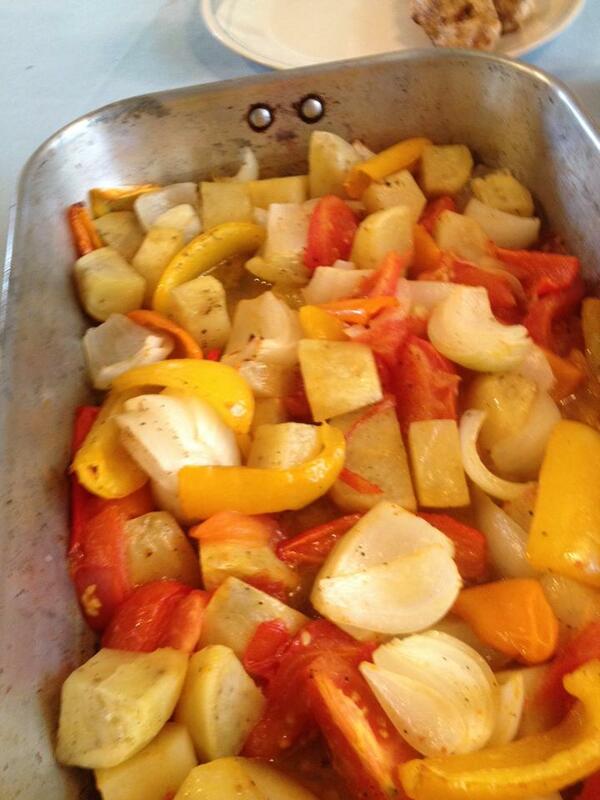 It was also very good over the mixed baked veggies we are along with the chicken. So, that is the show, folks. Those are all of the recipes I’ve made in this “fourth quarter” of my cook-through. I have loved every minute of cooking through this cookbook. Hands down; plain and simple. I love Marcella’s recipes. Her no-nonsense style of writing is straightforward and while you might think she’s being a finicky $&^@! asking you to do something incredibly frustrating (like peeling a fresh, raw tomato)–she has her reasons. Every step is worth the effort in the end. I have learned so much by cooking her recipes this past year. She has made me a better cook and I wish I could thank her for it. So I will push myself to make many more of Marcella’s recipes in the coming year and continue to regal you with my kitchen experiences every few months. Sections that were sorely neglected in Year 1 (most notably “Gnocchi,” “Frittata,” “Veal,” “Desserts,” and “Focaccia, Pizza, Bread, and Other Special Doughs”) will get special attention in Year 2, I promise. See you soon in Cook Through Year 2! 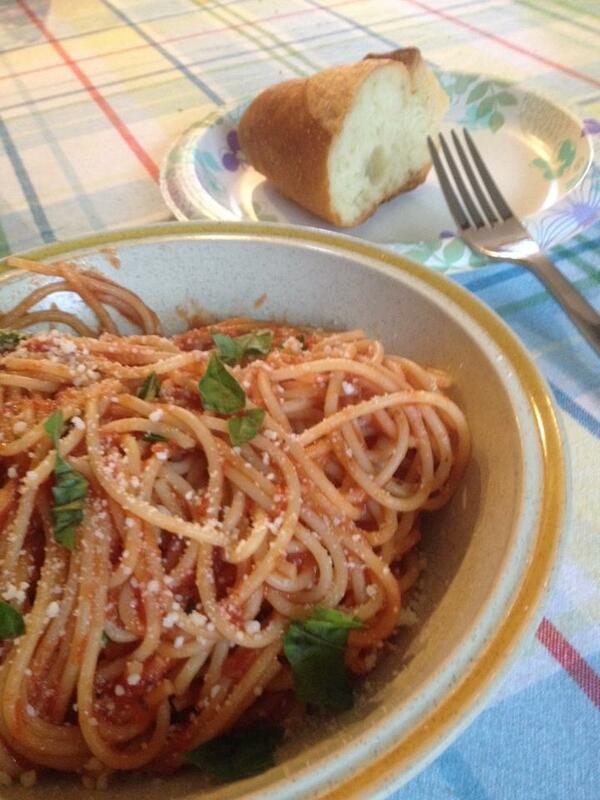 Italian food is my absolute favorite and I have the cookbooks to prove it! Beautiful pictures of beautiful food! Wonderful to read that someone else is tackling the book and loving it. I was going really well last year, but this year circumstances have made it a little harder….but I still journey on and (apart from two failures) have never been disappointed. I love the book! Your photography is great. Keep up the good work.